This is a recipe I ran across a while back in Vegan Planet. Unlike traditional eggplant parm, the eggplant slices aren’t breaded. Instead, you bake them in the oven for a while to get them tender while you make the sauce on the stove top. The sauce part calls for burger crumbles to round it out a bit, but I’m not really a fan of those or of TVP, so I used chickpeas instead. I think the last time I made the dish, I used white kidney beans. Either way, beans make a suitable and hearty substitute. Plus, I just plain enjoy chickpeas! To go alongside, I cooked up some quinoa in vegetable broth and added a little Italian seasoning. All in all, it came out good. My mom and I ate one half and my brother ate the rest! Clearly this one is a hit. A mini-announcement: on the 10th, my mom and I will be popping over to Massachusetts for a short vacation. I’ve found a few vegan-friendly restaurants that I want to check out, and hope to be able to blog a review or two! Why upstate NY is so deficient in these sorts of restaurants is beyond me. Comments Off on Using up the eggplant! 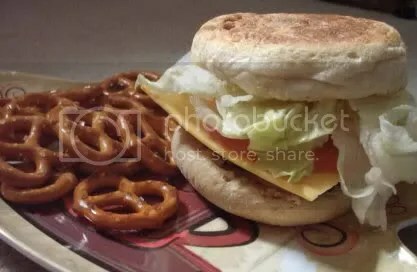 Sandwiches are a fairly universal food in that they can be comprised of pretty much anything you have in the fridge. Given decent bread and a little imagination, it’s easy to blow past the stereotypical lunch meat and cheese combinations that may have haunted your non-vegan days. I’m guilty of having scarfed down more than my fair share of rather scary bread-and-meat concoctions when I was younger. But I still love sandwiches. So now, instead of meat, I like to play around with various veggies to create new and different lunchtime treats! — Place toasted bread on a plate or flat surface. 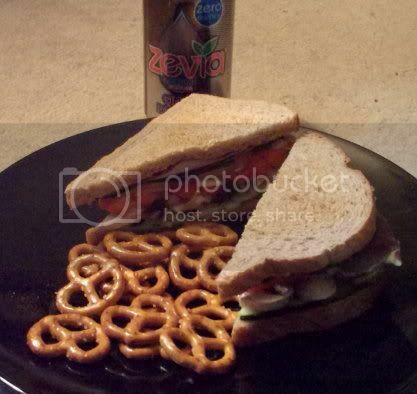 This may sound painfully obvious, but if the bread isn’t level, the sandwich will try to slide apart. — Layer the zucchini slices on one piece of the bread, followed by the mushroom slices, onion, red pepper, tomato, herbs (if using), and cabbage. — Spread your desired spread on the top piece of bread, close up the sandwich, and press down a little to help the sandwich stay together. 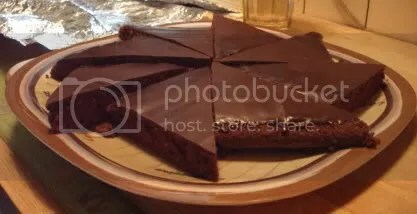 — Slice on the diagonal (or not, but it does look nice) and enjoy! I love to cook in general, but every once and a while I’ll go on a particularly prolific cooking or baking spree. The past couple of days have been like that and, crazy foodie that I am, I thought I’d share some pictures. 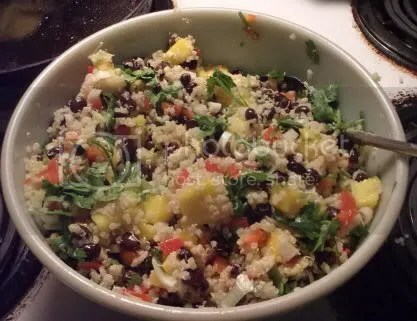 Red peppers, scallions, black beans, mangoes, quinoa, fresh cilantro…really, what’s not to like? Reading the recipe, I was reminded of some of the freshly-prepared foods our local co-op offers in their deli section. They’re big on colorful mixes of grains, beans, and herbs. This salad is just as good as, if not better than, the concoctions I get there. Plus, mangoes are one of those things I go crazy for. I layered all of that up in a 9×13 baking dish, sprinkled a little vegan parmesan on top, and baked it at 350°F for 45 minutes covered, 15 minutes uncovered. All in all, it made 8 good-sized servings. It came out pretty good, but I think it could have used a little more sauce. 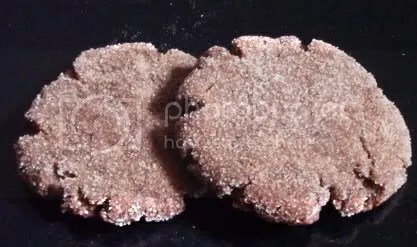 Meet the lovely and mouth-igniting Mexican chocolate Snickerdoodles, straight out of Vegan Cookies Invade Your Cookie Jar . (Yes, I’ve been feeling the cookbook love!) I am a sucker for spicy food, chocolate, and spicy chocolate, so these were a very “me” choice. They are very spicy–1/2 tsp of cayenne in the dough–and my mouth was pleasantly lit up by the time I was through munching the two pictured here. So that’s what I’ve been up to in the kitchen! 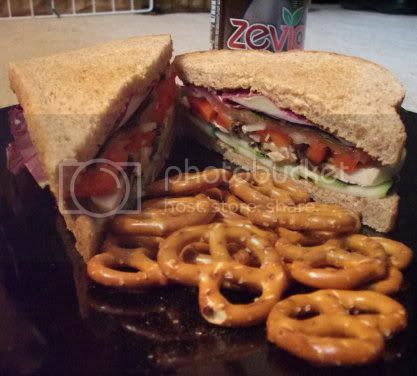 Next week, I’ll be posting some pictures of and ideas for veggie sandwiches, since those are a big item on my weekly menu. ‘Til then, rock on! In general, my family doesn’t eat a lot of cake. Though I love baking, cake is one of those things that is not only time-consuming, but also a little heavier on calories than I’m comfortable with. However, I’m not adverse to a tasty chocolate treat on special occasions, so for Mother’s Day yesterday I pulled out the cookbooks and browsed for something appealing. The cake is the quick and easy “Chocolate Cake” recipe from Colleen Patrick-Goudreau’s The Joy of Vegan Baking (a beautiful book if ever there was one! ), and the glaze is from 1,000 Vegan Recipes . The result was a moist, delicious chocolate cake with a hard chocolate glaze topping. I cut the recipe in half and baked it in an 8-inch square pan. Then I decided that the square looked boring. So I did a little playing around and came up with this flower-type arrangement. 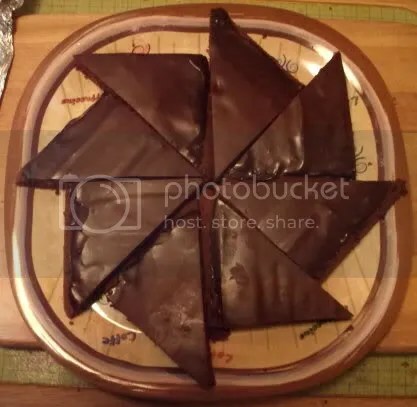 The neat thing about it is that each triangle is exactly one serving of cake! That, and I’m a sucker for triangle-cut food. My mom loved the cake–which was what I was hoping! And there’s enough left to enjoy it for several more days. It seems that new and seasoned vegans alike still love their pizza. Take a look in just about any vegan cookbook (and on many vegan websites! ), and you’ll find at least a few recipes for this much-loved food. And what’s not to like? Just yesterday my mom and I were discussing meal variety, and we realized that pizza is one of the most versatile foods out there. This remains true with vegan pizza. 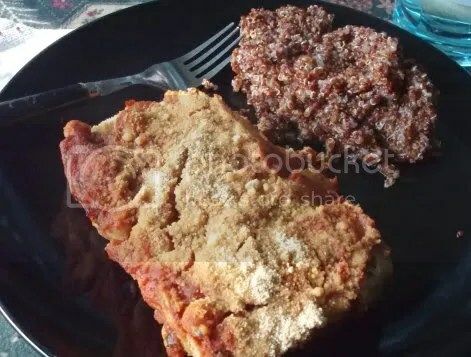 Seasoned meat and cheese lovers may have a hard time believing this, but it’s not much of a leap to take the amazing combinations of food that are out there in other dishes and apply them to pizza. I want to share a quick recipe for a rather quirky pizza that I whipped up for myself the other night. I didn’t measure anything, so most of it is “to taste”, but that’s another great thing about pizza–it’s very easy to personalize! I made a personal-sized pizza, but you can make it for as many people as you like. 1) Preheat oven to 425°F. Lightly oil a pizza pan and spread the dough out in it. 3) Spread the sauce over the dough to within 1/4 inch of the edge. Sprinkle with vegan parm, if using. 4) Add the pineapple chunks and shredded kale, then sprinkle with the shredded mozzarella. Bake 15-20 minutes, or until the crust is lightly brown and the edges of the kale are crispy. Feel free to add any other toppings/seasonings that strike you as appropriately “Eastern”. Let me know what you come up with–I’d love to try new combinations! When I’m not cooking, I…mess with computers! 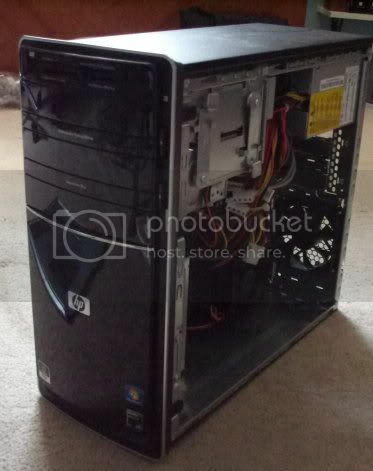 Several years ago, I switched from desktop computer to laptop for most of my computing needs. The laptop is more portable and generally less of a hassle to maintain. But I still like to use my desktop machine for messing around with audio and video and, of course, to play the Sims! My brother helped me build my old machine years ago, and I’ve been using it ever since, making the necessary upgrades here and there. But ever since Sims 3 came out, it’s become more and more of a struggle to get it to cooperate with the game. After several annoying issues whose potential fixes turned out to be more trouble than they were worth, I decided it was time for a change. I picked this up last week and have been loving it ever since. 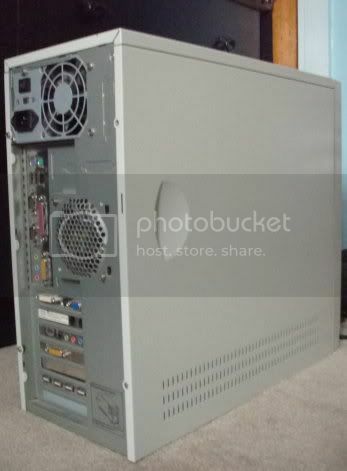 It has a faster processor and almost three times the memory of my old desktop, as well as a better graphics card. And it’s so quiet that I can barely tell it’s running most of the time! There are still a few kinks to work out (Windows 7 seems not to be fond of hardware changes), but as a gaming machine I think I’m going to like this one a lot. As far as food goes, I haven’t been cooking anything bloggable these past few days, but I did whip up some of Lauren Ulm’s smoky miso tofu slices for sandwiches a few days ago. Now all I need to do is find me some good-quality English muffins. White bread ones taste good enough, but the ingredient list scares me a bit! I’m leaning toward investing in the sprouted Ezekiel kind when my mom and I visit the local co-op this weekend. Comments Off on When I’m not cooking, I…mess with computers! Having (thankfully!) recovered from my bout with the stomach bug, I’ve been back to cooking! Anyone who knows me knows that I’m a sucker for both Chinese takeout and rice. However, given the ambiguity of a lot of takeout, I prefer to make my own food. 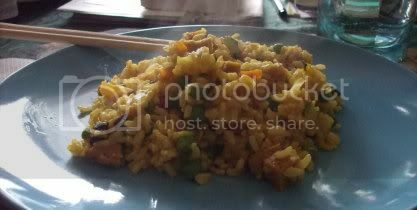 Here’s her very tasty vegetable fried rice. The original recipe only called for veggies, including zucchini, which I never would have thought to put in fried rice! In order to make it a one-dish meal, I tossed in some seitan. The end result was awesome, and I’ll definitely make it again. 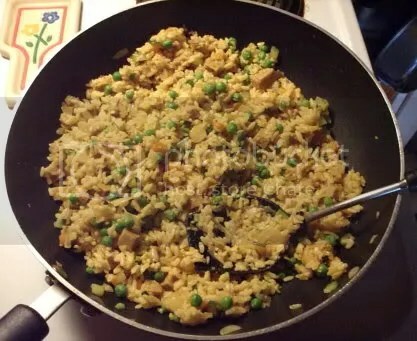 You’ll notice that it’s the same lovely yellow color as fried rice you’d get at a Chinese restaurant. That’s because I also love tumeric. The recipe called for an optional dash of it, and of course I had to put it in. I have been cooking other things, but nothing like so photogenic. 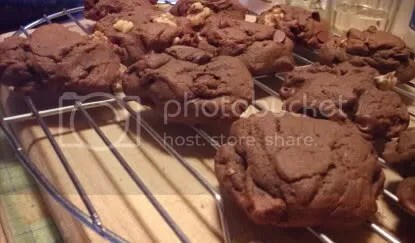 Chances are I’ll be breaking out another cookie recipe soon, and hopefully noodling around with a dish or two of my own creation! Comments Off on "Takeout" at home! After hearing about it in magazines and on websites after its release, I finally got a chance to read Jonathan Safran Foer’s nonfiction book about factory farming, Eating Animals. These are my thoughts. Everyone who eats needs to read this book. Not everyone who eats animals–everyone who eats, period. You will not want to read it while you’re eating, and probably not right before eating. You might not want to read it too soon after eating, either. In fact, if you ever want to eat again, you probably won’t want to read it at all. But you should. Foer begins with a simple premise. Upon becoming a father he, like many parents, wanted to know: what am I feeding my son? He asks, what exactly is meat, and what does it mean when we, both as people and as a society, eat animals? What follows is a frequently troubling, sometimes disgusting, and almost constantly disturbing collection of information drawn from three years of research into how meat is produced on a mass scale. Without apology, Foer shatters any last vestiges readers might have of the idyllic farm image. Gone are the rolling pastures and reassuring red barns. Gone are the chickens scratching in the yard, the pigs rolling in the mud, and the cows grazing in pasture. What Foer lays bare is a profile of corporations with only one goal: to provide people with a cheap commodity that “tastes good”, whatever the cost to the animals, the environment and, ultimately, the very people it serves. Regardless of your current diet or where you stand on issues of environmentalism and animal welfare, there are things in this book that will shock and disturb you. Foer relays everything from conditions he witnessed himself on a late-night foray into a poultry farm, to first-hand accounts from current and former slaughterhouse workers. He offers shocking statistics regarding disease, waste, and poor conditions for every industry including the fishing industry. He talks about antibiotics and pandemics, excessive amounts of manure, bycatch, abuse, overcrowding, self-regulating practices, and more. If you didn’t know it was bad, you’ll learn how bad it is; and if you already thought it was bad, you will be assured that it is even worse. Foer does not entirely exclude the other side. He offers views from ranchers and slaughterhouse owners, often those who try or believe they are trying to be more ethical or humane in their practices. He champions those who are making a deliberate move away from the factory farm model. He offers information for people who eat meat but don’t want to contribute to the current assembly-line production standards. For those with stronger ethical, moral, or dietary standpoints, Foer’s position may not seem like enough. His stance may seem to lack concrete conviction. But for the middle-of-the-road, where the majority of those who read this book will most likely find themselves, it is a stance that can be identified with, a jumping-off point for a deeper understanding of what it means to eat meat in today’s society. While Foer ultimately doesn’t make a direct argument for any particular kind of “ism” (environmentalism, vegetarianism, veganism, etc. ), what he does say is clear: the things we decide to put on our plates and in our bodies matter. No individual can put an end to factory farming by choosing a veggie burger over beef, but such a choice can and does affect people other than oneself. I would love to be able to blog about all the awesome things I’ve been doing–especially awesome things I’ve been cooking–but alas I’ve spent the past five days trying to beat a nasty bout of the stomach bug. Out of all the diseases it’s possible to contract, stomach flu frustrates me the most! Cooking, baking, and eating are such big parts of my life that it’s a huge bummer to be relegated to the land of animal crackers and rice. On the upside, there has been Yogi Tea’s ginger tea. In order to avoid sounding like a commercial for it, I’ll just say this: YUM, whether or not you have a stomach ache! Chocolate Agave Trail Mixers, from the fabulous Vegan Cookies Invade Your Cookie Jar. (I’ll gush about this book at length in a later post.) Agave nectar was on sale at the local co-op this month and, never having used it, I decided to pick some up and grab the tastiest-sounding test recipe I could find. I used walnuts and left out the dried fruit, as I was lacking dried cherries and am not a fan of raisins and chocolate together. Yes, they’re good. They’re amazing, in fact. My mom and I have been gobbling them down every chance we get. I also updated the layout of the blog–I’ve always been a sucker for notebooks, even digital ones. There are still a few things that need tweaking, but overall I’m happy with it. Let me know what you think! That’s all for this rather short post. I’m hoping to do more cooking over the weekend, and maybe whip up some brownies next week. Here’s to being able to eat real food again! It’s well-known that obesity is a growing concern in many developed countries. We hear about the negative health effects of being overweight all the time. By contrast, we see television shows, movies, magazines, and advertisements full of ultra-thin women and buff men–images that often evoke a negative attitude toward our own bodies. There are of course many health benefits to reaching and maintaining a healthy weight. However, the contrast between the sizes and shapes of real people and those of models and actors has led to the belief that you can never be too thin. I am currently about 10lbs. underweight. The reasons for this are beyond the scope of this post, but for clarity’s sake I will say that it has nothing to do with eating a vegan diet. (Far too many people assume that vegan and thinness are synonymous!) It’s also not for lack of trying. I eat quite a bit of food and try to keep my diet full of varied fresh, plant-based dishes and nutrient-packed snacks. When I first began talking to doctors about my weight, I was startled by the repeated question, “Have you tried exercising less?” I was exercising maybe 20-30 minutes a day, five days a week–not an excessive amount. It still strikes me as astonishing that multiple medical professionals would suggest cutting out exercise as a tool for weight gain rather than eating more food. This shows how deeply ingrained the idea of extra food being a bad thing is in our society. The other thing that disturbs me about being underweight is the envy it can elicit from other women. I can’t count how many times I’ve been in a conversation about food or health and heard the remark, “Well, you don’t have anything to worry about!” In public, I’ve been on the receiving end of dirty looks from complete strangers. And sometimes when I mention how much weight I lost, I get a response like, “Good for you!” Rarely, if ever, have I gotten a concerned reaction from people outside my family. I try to make it a point to tell people that being underweight is no fun. Can I pull off outfits I never would have considered wearing when I was 20lbs. heavier? Sure. But I also can’t enjoy walking around barefoot because my feet are so thin it’s painful to walk without shoes on. Pants of all sizes fall off me. In a bathing suit, I look like a walking skeleton. I have no hips on which to balance things like heavy laundry baskets or big bags. In the grand scheme of things, looking good in one outfit or another is hardly a positive trade-off. With all the focus on weight loss and hype over diet products, it can be very hard to find useful information on how to gain weight in a way that’s healthy. Essentially, underweight people are dealing with a problem that very few others believe is a problem. In my experience, the best thing to do is take charge of your own health. Read what you can find, ask questions of people you know are knowledgeable, and seek out the truth rather than sensationalism.